David Shiner (left) and Bill Irwin in "Old Hats"
Comics Bill Irwin and David Shiner tap dance, mug and clown their way through a polished evening of fun. To say something is “old hat” is to say that it is passé, out of style, yesterday’s news. And, indeed, clowning and mime have seen a gradual decline in popularity since the glory days of Charlie Chaplin, Emmett Kelly and Marcel Marceau. But some old hats have retained their shape into the 21st century. 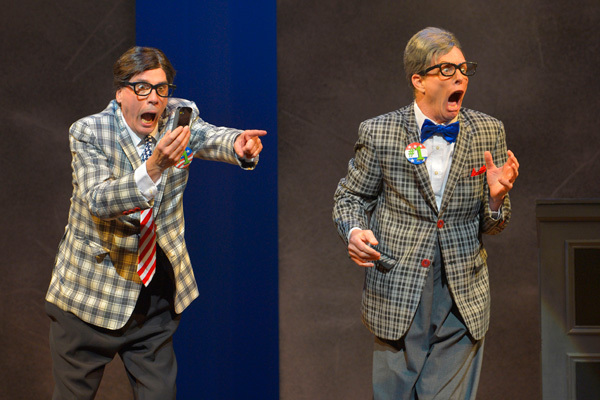 Clowning, the way Bill Irwin (who came up by way of San Francisco’s Pickle Family Circus all the way to Broadway) and David Shiner (who did the same with Cirque du Soleil as his jumping-off point) do it, is a kind of art form. Their newest show (the last collaboration was the highly-acclaimed “Fool Moon”), “Old Hats,” was a huge hit for Signature Theatre in New York in 2013. Now it has come to A.C.T. in San Francisco in a production deftly directed by Tina Landau. Brief sketches — a businessman has a hilarious interaction with his iPad; a sad tramp rummages through a trash can in a park; two old guys practice one-upmanship by exchanging their pills while waiting for a train — are interspersed with songs delivered by the tremendously talented and engaging Shaina Taub and her quartet. Taub not only sings the songs in a way that endears her to the audience, but she also wrote them, and the lyrics as well. Aside from that, the rest is silence. Shiner and Irwin keep you rolling in the aisles without uttering a word. A little later they will try their hands at singing (“Oklahoma” yet), reciting a little Shakespeare and bantering with Taub but, on her advice, they soon return to what they do best. Two extended sketches, both involving audience participants, are simply fantastic. The first, with Shiner as a seedy magician who has seen better days and Irwin, in delicious drag, as his assistant, involves sawing a lady from the audience in half. The second, even longer and even funnier, has Shiner directing an old-time Western movie with four audience volunteers who really got into it on opening night and turned up some comic talent of their own. The two loose-limbed, rubber-faced comics have a kind of good-cop, bad-cop relationship, with Shiner the curmudgeon, a little hot-tempered and crabby, and Irwin more gentle and sweet — until it’s his turn to pound his partner over the head with a rubber mallet. Together they are dynamite, tap dancing and mugging their way through two fast-moving hours of comedy.